Lots more coming later today. Thanks! I was hoping to see my stuff back from heat treat on Friday but alas, no UPS man this week...maybe Monday or Tuesday. Have a nice weekend everyone! I have new stuff on the horizon as usual. Probably by the end of next week I should have a couple of major new offerings ready to go. I've spent much of the past two weeks grinding and milling, working on two new batches at a time. Also managed to squeak in another smallish batch of Nibbles so there will be more of those in the near future too. But the big batches are of Mini FunnyBones and the new Atwrench™. These new tools show a return to simpler designs (no captive bits) but they nevertheless are packed with functions. The Mini FunnyBones feature 7 American SAE wrench sizes and 7 metric wrench sizes in one compact 3 1/4" overall length tool. Also has my standard bottle opener/wrench opening. I really like the feel of this tool in the hand and I'm excitedly anticipating getting them back from heat treat so I can claim one for my own pocket. :) A titanium version of this tool will probably be in the future if these do well. 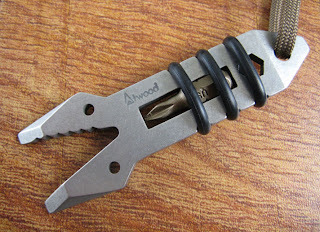 The Atwrench™ is my updated version of the old Proto Screwdriver tool. Many people are familiar with this classic keychain screwdriver design which has been made for probably 80 years or so. There have been many similar pieces on the market but the Proto is the most iconic of them, instantly recognizable with it's distinctive forged shape. Snap-On and others have also done their own stamped versions. My idea was to start with the basic overall shape of these tools and size it up, adding features to it as I went. The end result looks like it's on steroids. 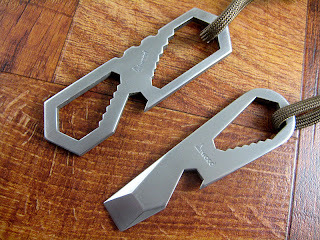 It incorporates 7 American SAE wrench sizes, a bottle opener and a pry tip. And, just so my world wide fans don't feel left out, the companion metric version will be coming along sometime this summer. Howdy folks, I'm finishing another batch of Crawdaddies and I made a few very minor changes as I mentioned in earlier posts. 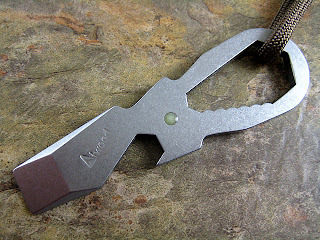 For these I adopted the slightly wider body of the SharkTooth and RingLeader tools to provide for an improved grip. In addition, this gives me the ability to put on a thicker and stronger O-ring. Otherwise the tool is just about the same as the first series. I have a few dozen Nibbles back in stock. The beefy Crawdaddy 2 will make it's appearance Tuesday or Wednesday.